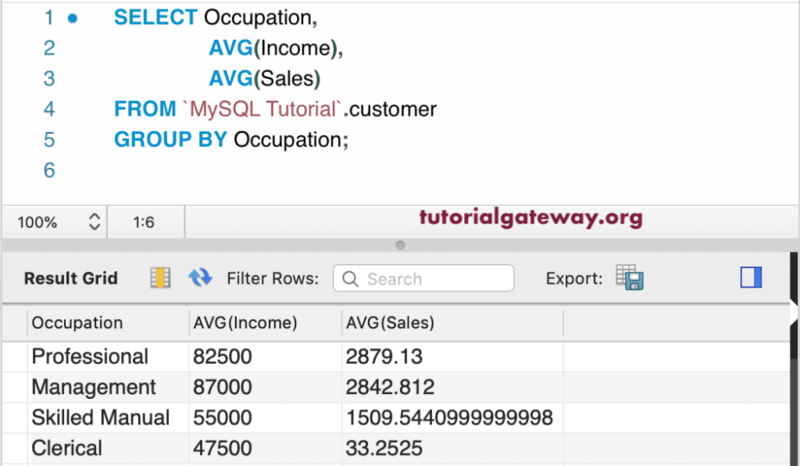 The MySQL GROUP BY Clause returns an aggregated data (value) by grouping one or more columns. It first groups the columns, and then applies the aggregated functions on the remaining columns. 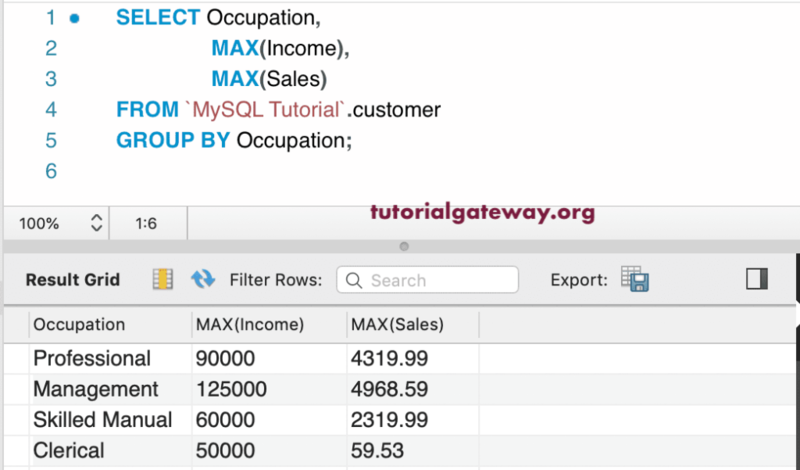 TIP: To display the high-level or aggregated information, you have to use this MySQL Group by clause. 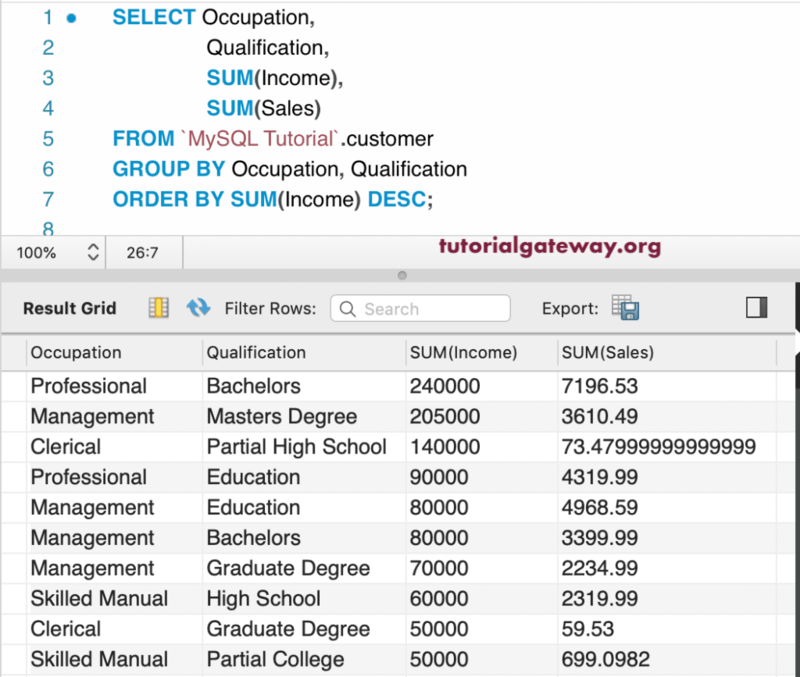 For example, to find the Total Sales by continent or region, use MySQL Group By Clause to group the Country names in a Continent or regions. 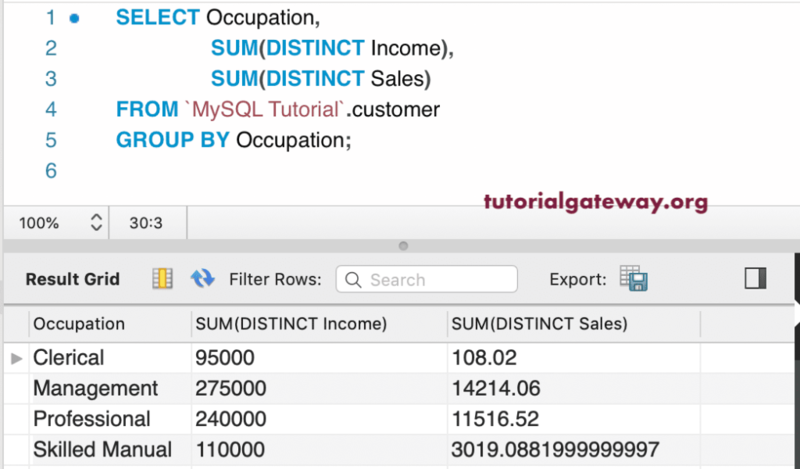 Next, use the aggregate SUM function to calculate the total. 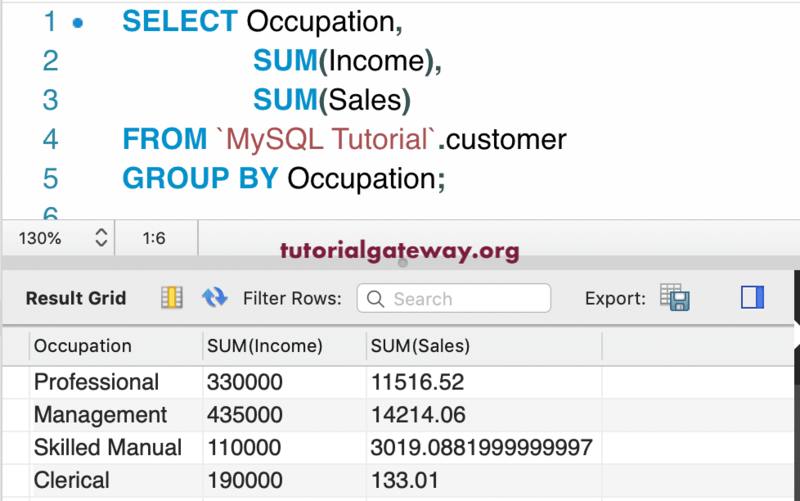 Column1…N: Choose the columns from a table(s). Aggregate Functions: Use any of the aggregate functions. COUNT, SUM, AVG, AVG, MIN, MAX, STD and VARIANCE are the functions that we can use. Group By: Columns which are not part of an Aggregate Function have to place after this Group by. 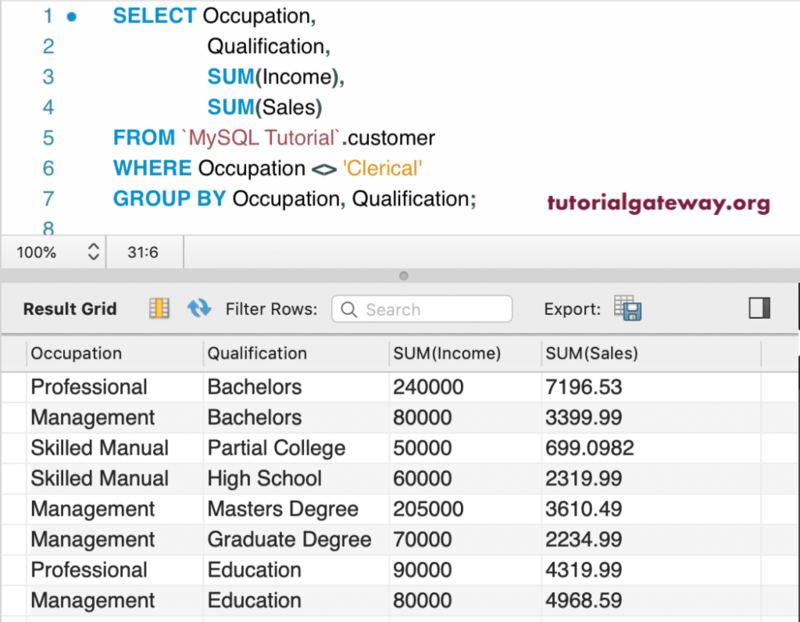 In this article, we will show you, How to use Group By clause to group the data. For this Group By demonstration, We are going to use the below-shown data. In this example, we used a single column in the Group By Clause, and Count function. 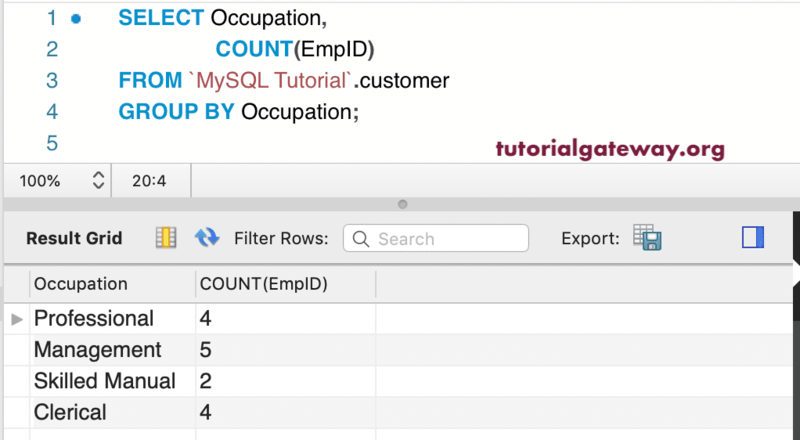 The following query counts the employee ids in each occupation group. 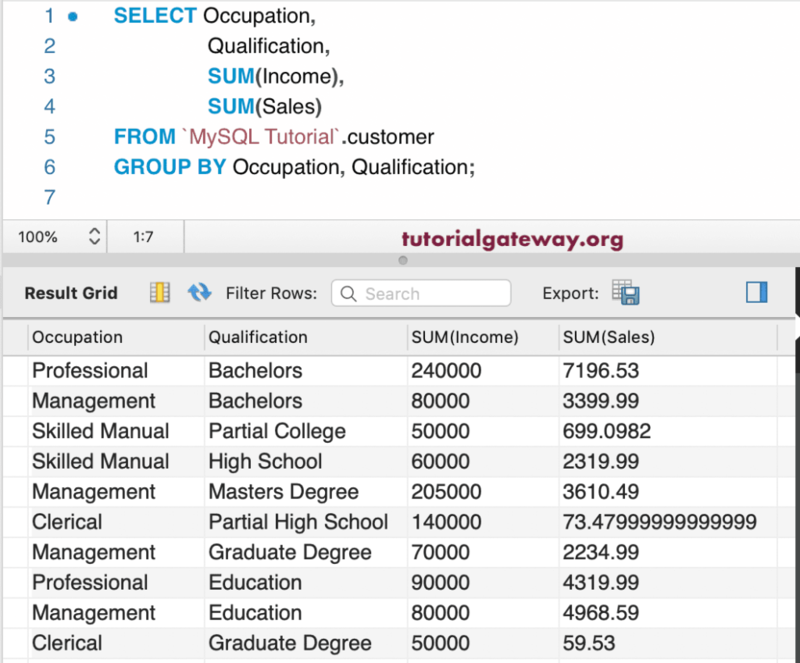 In this example, we use Sum function to calculate the total income and total sales in each Occupation. This time, we are using the Distinct keyword along with the Sum Function. The following query finds the Sum of distinct income and sum of distinct sales in each occupation group. Here, we used AVG function to find the Income average and Sales Average in each Occupation. 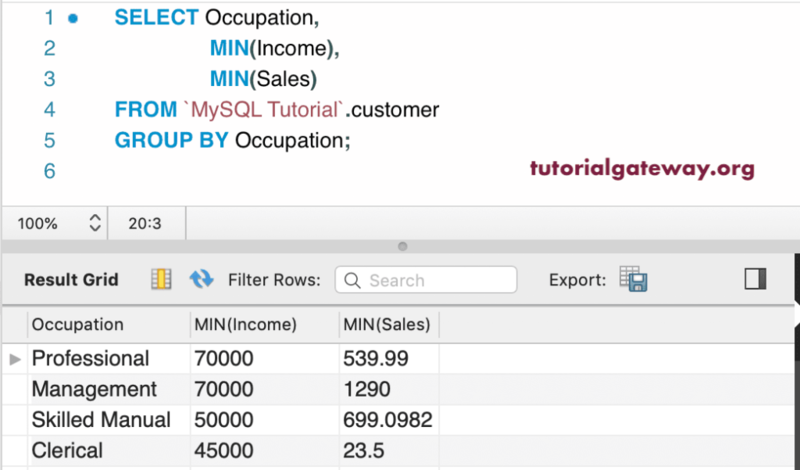 In this example, we used Min function to find the Minimum Income and Minimum Sales in each Occupation Group. Here, we used Max function to find the Maximum Income and Maximum Sales in each Occupation Group. In this example, we are going to use STD, STDDEV, STDDEV_POP and STDDEV_SAMP functions to calculate the Standard Deviation of each Occupation. 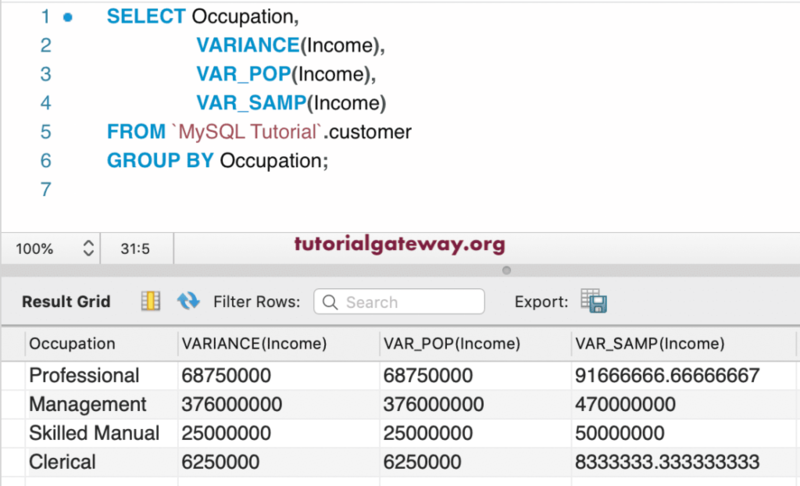 Here, we used the Variance, VAR_POP and VAR_SAMP functions to calculate the Variance in each Occupational group. In this example, we are going to use Multiple Columns. First, it groups the rows by each Occupation and then Qualification. Next, it will find the Sum of Income and Total sales in each group. From the above, though, we grouped by the Occupation, column values are repeating. This is because, we used Occupation and Qualification columns in the group by clause. 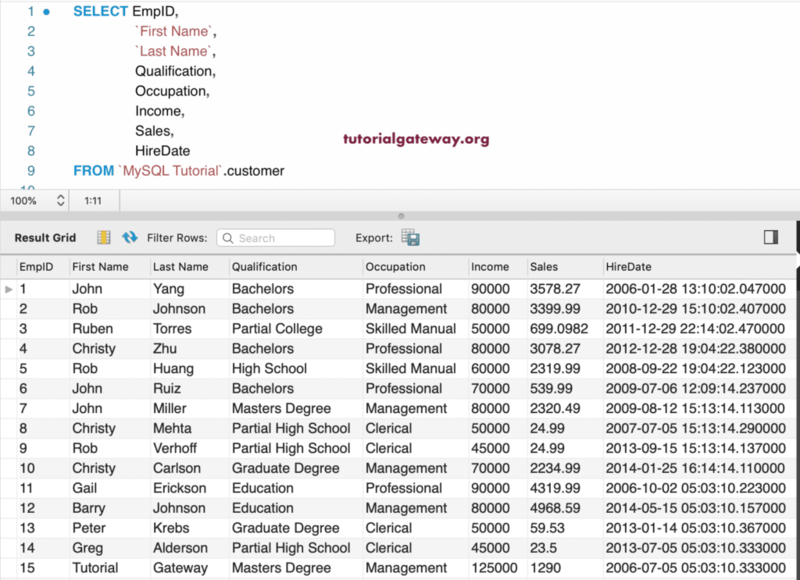 Along with this Group By Clause, you can also use Where Clause to restrict the records selected by the query. We can also use Order By along with the Group By. Here, the grouped result is sorted by Total Income of each group in descending order. In this group by example, We are using all the functions within this command prompt.